If you’re concerned about your child or employee’s activities on the Internet and want to go beyond standard site-blocking software, monitoring software might be your key to peace of mind—assuming you have no moral qualms with spying on your family or employees. Retina X Studios has released a Mac version of its SniperSpy monitoring software that lets concerned parents and employers silently watch the entire screen of their children or employees’ Macs instantaneously from any location. It’s a hybrid surveillance system that also displays full activity logs of keystrokes, chat conversations and other activities. SniperSpy Mac is designed not to give any indication of its existence on the Mac on which it’s running. Once installed and set up, it runs in the background and silently records screenshots and activity, logging and uploading them to a secure Website. You can view activity by logging into the Website from any browser, including those on smart phones. SniperSpy also gives you real-time file system access and live viewing of keystrokes typed. All activity on the remote computer is logged and uploaded for later viewing, along with screenshots. All chat conversations, keystrokes typed, Websites visited and more are recorded and saved for you to browse through. Though Retina X Studios markets SniperSpy as a way to “spy” on others, its site has a disclaimer stating that the software must only be used on computers that you own, or on computers whose owners have provided you with written consent to have the software installed—any other use is illegal. So think twice before you try to install it on your co-worker’s computer to find out how much time he spends bidding on eBay every day. 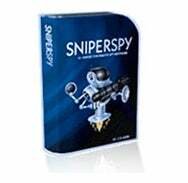 SniperSpy requires OS X 10.5 or later and costs $40 for a three-month subscription, $60 for six months, or $80 for 12 months.